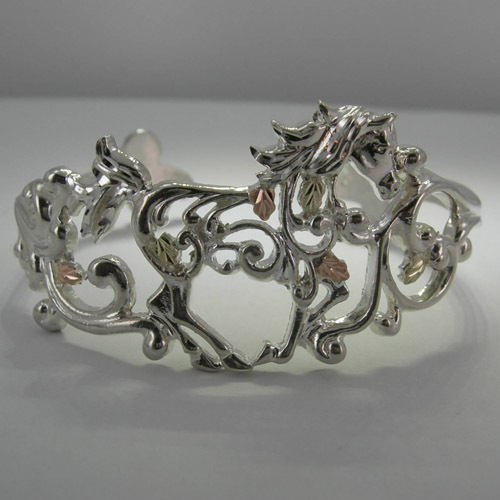 Desc: Black Hills Gold Sterling Silver filigree galloping horse cuff bracelet. 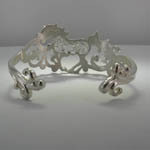 The bracelet is fashioned to resemble a galloping horse with flowing mane and tail. 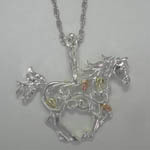 The horse is open and has beautiful filigree work with green and rose gold leaves along the body. The bracelet has diamond cutting for shine and a bright polish finish. 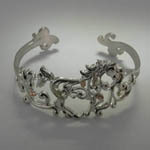 The terminals of the braclet have scroll work design. Made in the United States of America. We have a matching necklace, see SK1014.